I'm about to dive head first into the daunting task of painting the entire interior of our 10 year old home. I’m estimating that by fitting the painting into my evenings, It’s probably going to take me at least 5 years to complete… so laters lovelies, I'll see you then! Unfortunately, as there are no spare wads of cash stashed under our mattresses, I am going to have to do all the painting myself, and so rather than attempt to tackle the whole lot in one go, I'm planning on working my way around the house with the paintbrush, room by room. The dining room and the laundry & utility rooms are already done for now, (thank Heavens). The Chalk Quarter white did wonders for brightening up the laundry, and I do still love the element of surprise the Jericho Jade colour brings to our dining room. But as for the colour I'm going to choose for the rest of the house? I'm sort of stumped. Currently, most of the rooms in the house are painted a safe bland taupy sort of colour, courtesy of the builders. Nothing against taupe, but it's just not us and as there are parts of our house that don't get a whole lotta sun, I do need to be careful with my colour choices. The first two rooms I am going to start with are the entry and the master bedroom. The entry is easy, I want it to be white and bright so that I can accessorise it with prints, signs and artwork I have been collecting, and so I am going to stick with the Chalk Quarter for those walls. As for the bedroom? Yeah well that’s kinda where I come unstuck as this bedroom is very bright. Currently we have three taupe walls with a chocolate brown feature wall behind the bed, covered in white decals. Whilst I love the decals, I’m no longer so fond of the brown. And so now I am debating, do I still have a feature wall behind the bed, or do I stick with one colour? I can’t seem to decide for myself, so it’s no wonder that research shows that over 70% of Australians stick with white when it comes to interior walls. We are totally scared of making the wrong choice… and so we become commitment phobes of the paint colour kind. Fortunately for me, and any other poor bugger who is stuck on colour choices, Taubman’s have a fabulous Paint Your Own Room Tool that allows you to upload an image of the room that you plan on painting, and digitally re-colour the walls with any hue that tickles your fancy. And here’s where you guys come into play. I need your help… please! 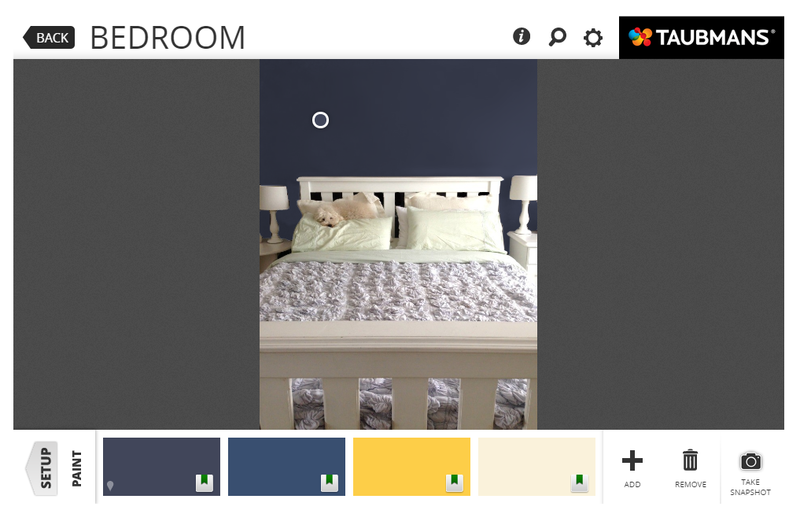 I thought I would give the Paint Your Own Room tool another whirl to see if we can narrow down a choice of colour for the bedroom and I would totally love your opinion. 1. Upload your photo of the room you want to paint. 2. Mark your walls you want to paint. 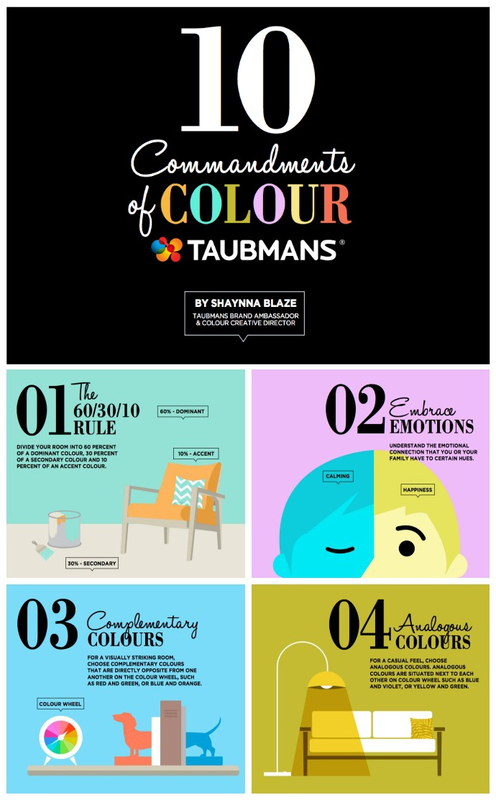 Taubmans Brand Ambassador and Colour Creative Director, Shaynna Blaze has created Taubmans 10 Commandments of Colour - which are basically 10 tips to help punters like me, debunk the common colour myths that are scary enough to put me off using colour on my walls. The most useful for me were the tips on Manipulating space with the right colour combos - cool colours to recede and make a space look bigger, and warmer colours to brings the walls toward you and make a large room seem cosier. 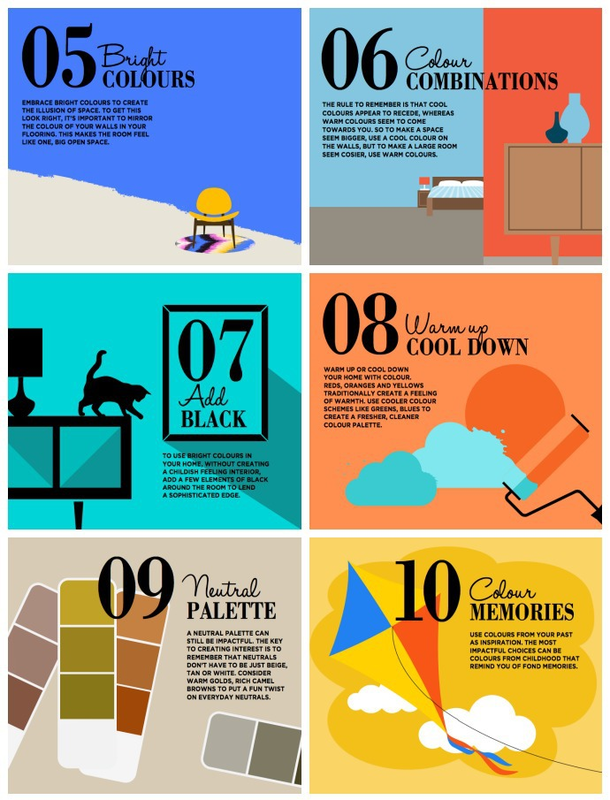 Are you up for a little virtual House painting for yourself? 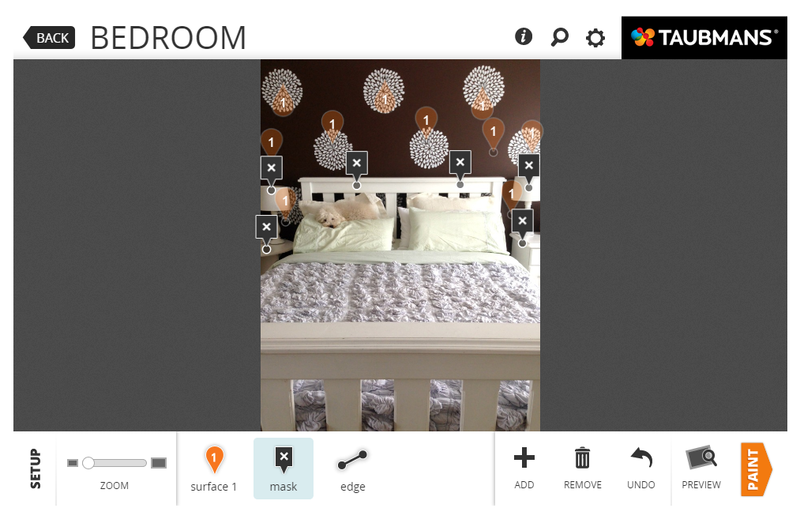 Then don't forget to try out the Paint Your Own Room Tool, and feel free to share your pics in the comments below or on my Facebook page, you know, so that we can all put our two cents worth in about what we would pick. 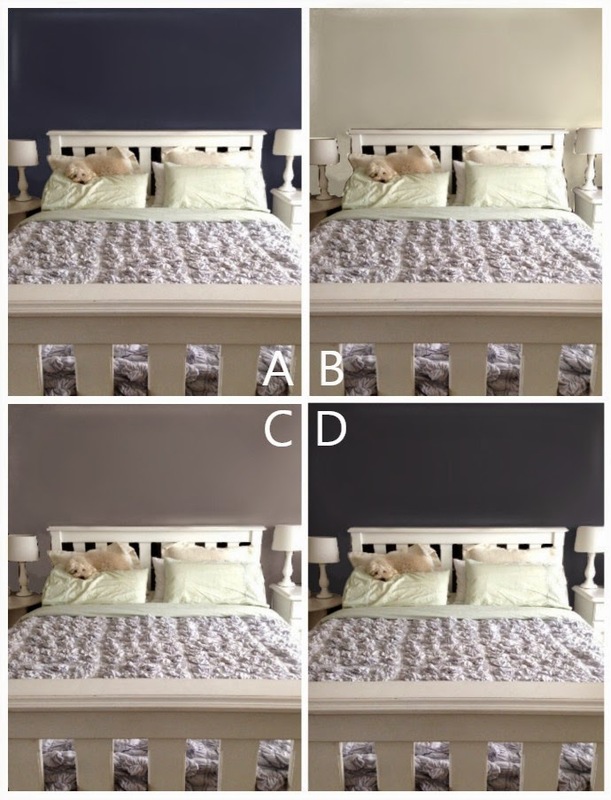 But for now, help a gal out will you please - which colour would you choose for my bedroom? A, B, C or D? 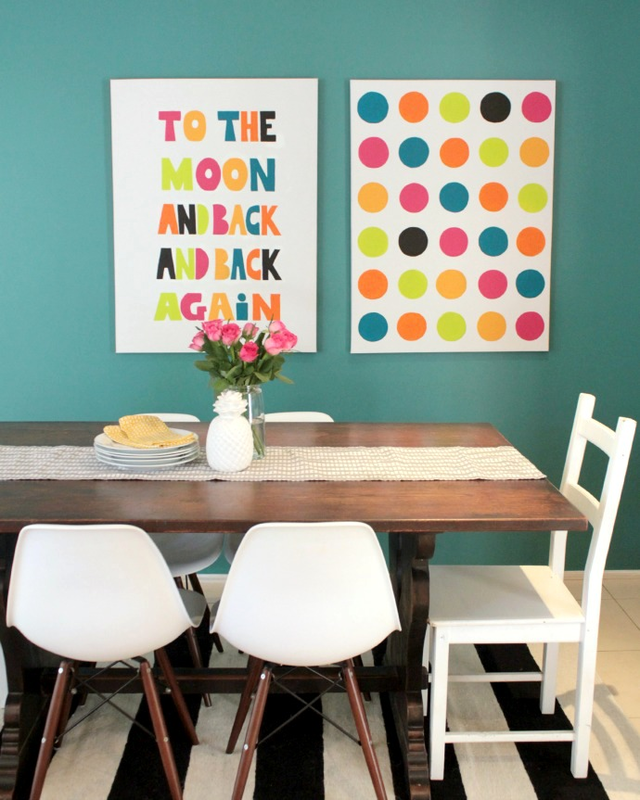 You need to imagine artwork or decals on the wall, but hopefully you get the idea!